Sorry, no review of Create yet. 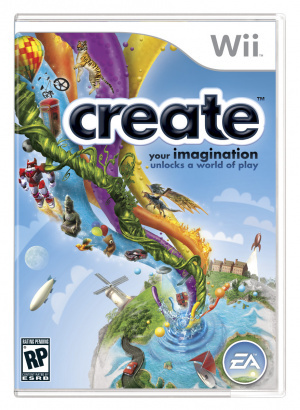 A must-have video game this holiday for the whole family that is powered by imagination and rewards players for being creative. The more players explore the game, solve level-based challenges, and customize their world, the more rewards will be unlocked. Creativity will be unleashed as players design environments with easy-to-use brushes and tools, including textures, props and animating objects that bring the scene to life. Friends can download and remix solutions and set challenges for other players to download and complete. Imaginations will run wild this holiday! I wonder if it is one of those creeper games or a good game that makes you jiggle like crazy when you put a disk into your game station. This came out on the 26th November in eu. @estoiagamer We appreciate you pointing out release date inaccuracies and helping us maintain the quality of Nintendo Life, but please try to understand that we're all unpaid volunteers here and sometimes we have to focus on one aspect of the site in favor of another. Also, you can always use the contact form to let us know about any issues you have with release date inaccuracies and such.